Hello, cardmakers! I hope you're all staying out of the heat and staying indoors to make some cards! Don't forget that the Beat the Heat challenge cards need to be in your shipper's hands by July 31 - a week from today, so get those packages in the mail ASAP! Be sure to include the packing slip! 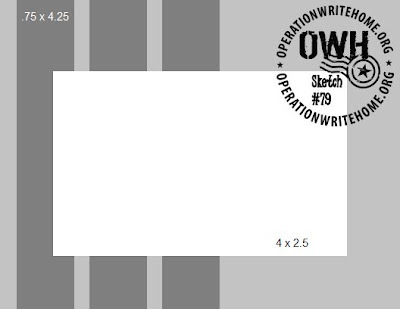 Remember that all OWH sketches are always designed for an A2 sized (4.25" x 5.5") card. Our samples this week were made by the fabulous Sherry! Visit her blog, Bits of Cheer, to see more of her beautiful work and leave her some love. Thanks for making these awesome samples, Sherry! Have an idea now for a cute sketch card? Get to work and don't forget to come back and show us what you made! Great sketch and great samples! Happy Crafting and thanks for sharing some wonderful inspiration!! Terrific samples Sherry! The sketch is great too and very flexible. Hope I can find some time to play this week! Love the sketch and the card samples! For those of you who miss adding glitter to your cards, those three narrow strips would be dynamite done with sparkle holographic ribbon - the metallic sparkle is completely encased in the acrylic ribbon. Hmmm . . .
Can someone tell me how to link a flickr photo here. I have linked the picture but the thumbnail here is not right. Hey, Katie! There's a step-by-step in this tutorial that shows the linky process.